It is the creation of the 16th century Italian condottiere, Pier Francesco Orsini. His Park of Wonders is situated on the edge of an extraordinary volcanic landscape strewn with huge tufa boulders easily the size of a house. 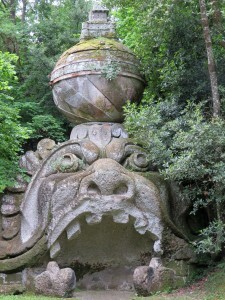 Orsini had the boulders carved into grotesque monsters, gods, goddesses, temples and fountains. And, in so doing, he turned this chaotic landscape into a place which is unlike anything else in Italy. Many of the statues have carved inscriptions which are designed to provoke thought and to challenge assumptions, as well as to entertain. The sheer scale is impressive. When I stood by the railing in front, my head just reached the eyes of the upside-down giant. It’s not very easy to see what’s what in the photo; the upside-down giant’s right arm in underneath his head and his hair flows to one side. An enigmatic inscription carved nearby reads: If Rhodes of old was elevated by its colossus, so by this one my wood is made glorious, too, and more I cannot do. I do as much as I am able to. What does it mean? This was an age when the aristocracy, both papal and secular, enjoyed displaying their superiority by their interest in philosophy and hermetic knowledge. The statuary is full of obscure classical allusions. Are the giants Titans? If so, they represent the ancient gods who were defeated by Zeus and the gods of Olympus. But why are they here? We don’t really know. This is a full scale building carved out of one of the tufa boulders. I climbed the stairs and went inside. The floor is tilted at a vertiginous angle and my instant reaction was to feel sea-sick. And that, I think, is exactly what Orsini wanted. 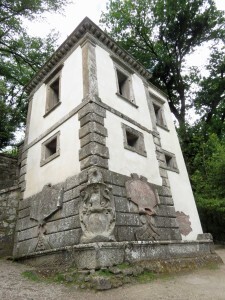 An inscription nearby reads: Dedicated to Cristoforo Mandruzzo, Archbishop of Trent. The mind becoming quiet becomes wiser thereby. I got the distinct impression that Orsini didn’t altogether approve of the archbishop. Maybe he was a know-it-all and Orsini felt he needed to be jerked out of his complacency. If you suddenly feel nauseous, at the very least you’ll stop talking! 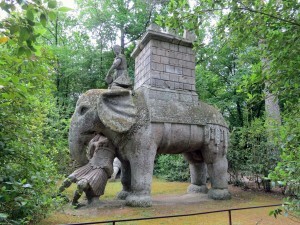 A war elephant has lifted up a Roman soldier and is about to hurl him to the ground. 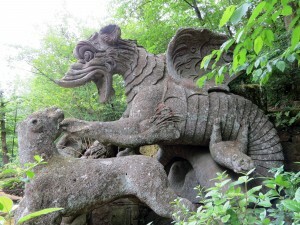 The elephant towers above you – my head came about halfway up its legs. This is a reference to Hannibal and the Carthaginian Wars which almost defeated Rome. This is not about the (eventually) victorious Romans; here, the elephant perhaps represents the power of the unconscious mind. One might argue that, about 350 years before Freud, Orsini is acknowledging the power if the Id. 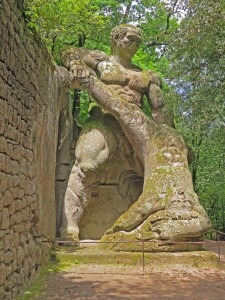 This vast statue looms out of the undergrowth. What does it represent? Normally, one would expect the lions to defeat the dragon. Here, I’m not so sure. The Park of Monsters also seems to be about turning one’s expectations upside-down. But there are also places in the Park where one can relax and enjoy oneself. A xystus (my word for the week, though heaven knows when I’ll use it again!) is an open colonnade or walk designed for relaxed conversation and recreation. 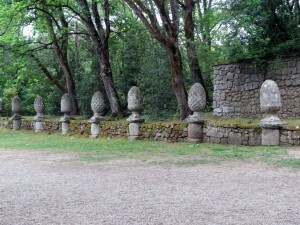 There are alternate pinecones and acorns on the plinths. The pinecones represent enlightenment and the third eye (the god Dionysus, or Bacchus to the Romans, always carries a Thyrsus, a wand of fennel with ivy wound round it and topped with a pine cone to represent the importance and power of the unconscious mind). Acorns represent spiritual growth. You can walk along the xystus and indulge in philosophical thoughts, or you can just enjoy the walk! 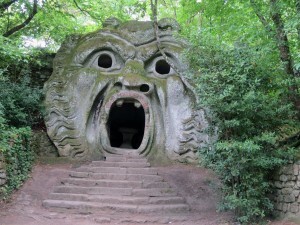 The Mouth of Hell is another monstrous head. Inside the mouth is a large cavernous space with a stupendous echo – I sang Donne Nobis Pacem (somewhat incongruously, I admit) and the echo reverberated right through my body. The inscription here reads: Abandon all thought you who enter here. This is obviously a reference to the message above the door of hell in Dante’s Inferno, which reads: Abandon all hope all ye who enter here. Orsini doesn’t want his visitors to abandon hope. He wants them to put aside all preconceptions, which is a very different matter. 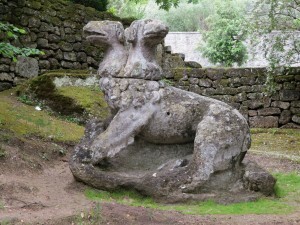 And, in case the visitor hasn’t got the point, a statue of Cerberus guards Hell’s open mouth. 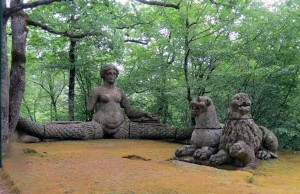 I leave you with a statue of a double-tailed mermaid which defies explanation. Who is she and what are the two creatures in front of her? I have no idea. And that is one of the attractions of this intriguing park. You have to be content not to know. Maybe that is the lesson Orsini is trying to teach us: sometimes we don’t know, and that is all right. What a fabulous place. I shall add it to my list of places to visit. (It is a very long list) Another great statue park is Memento Park in Budapest. The park is full of the monumental statues from the communist era, with some fascinating stories about why they were built and the messages they were intended to convey. It is also worth a visit if you get the chance in your travels. Memento Park sounds right up my street, Janet. It sounds as though the Park’s architects were trying to do something similar to the Park of Wonders – that is, get across a philosophical message they thought was important. It’s definitely on my list! Hi Elizabeth, what a wonderful coincidence as I visited there last month. Could not get a clear shot of the head with the cave behind due to the queue of people wanting to be in their own photo!!!!!!!!! I was on a garden tour and was enchanted by several of the wonderful gardens that have been created around Rome in the countryside. Thank you for your comment, Anne. I’ve also been to Tivoli and the Villa Lante. All wonderful in different ways. But I can’t help thinking that what these amazing places really need is ‘Friends of’, that is volunteers who can go in and clean the moss away from the fountain spouts and the encrusted creatures and let the water pour through as it’s obviously meant to do! Marvellous post. It actually gave me sympathetic shivers. I’m not sure I’d have been comfortable there. But what a place for igniting stories. Thank you! I’m so pleased you enjoyed it, Jenny. Yes, it was certainly atmospheric! Well, I’m amazed to recognise your joint effort!! Well done. I really just wanted to say that, after Andante, I tracked down A Desperate Remedy on tape – my eyes not being too good with the written word – and it proved ideal for relaxing in southern Spain where I just had to check out my nephew’s revamped swimming pool (+ avoid that referendum). It was really enjoyable and would, I suggest, make a good TV drama?? Thank you, Claire! You’ve made my day. And I agree that Marilyn’s photos are terrific. I’m delighted that you enjoyed A Desperate Remedy and that it gave you some hours of listening pleasure. The guy who read it is an actor, which helps. I was very pleased with how it came across. I was interested in your comment about it making a good TV drama. I started my career in Fringe Theatre – writing and directing plays, and I think it shows in my novels. I know how to end a scene to extract the maximum drama!